Seattle has had a rough few weeks—too much snow and freezing wind, mostly. Thankfully, it’s (finally) almost time for the Seattle Wine and Food Experience (SWFE), where we get to indulge in the safer, warmer side of winter. Four days of bite-size feasting and high-end pours, offered by hundreds of local vendors. The raffle prizes are fantastic and the photo opportunities will be endless: we just recommend that you wear your stretchiest pants. Each event comes with its own charm and must-try dishes—read on for a small sampling of the highlights. “Mom’s After-School Grilled Cheese” from Chef Perry Mascitti of Tulalip Resort and Casino, presenting sponsor of SWFE. Pesto, provolone, peppadew and sundried tomatoes—a lot of work for after school, but a delicious treat for a ‘hygge’ start to the event. Katsu Burger will offer a Japanese french fry bar with seven dipping sauces to pair with two types of fries. PAIR WITH: Cocktails from The Prohibition Bar, featuring The Real McCoy Rum and Perfect Pour Cocktail Co.
For those who can’t get enough of Korean fusion (everyone), Cantina Lena will have beef kimchi quesadillas. PAIR WITH: Paradise Peak Pilsner, Fremont Brewing Co.
On Friday, we drink bubbly and eat seafood at a venue new to SWFE this year: The Sanctuary Seattle, where DJ Dubreezy will be setting the scene. The vibe of POP! is a little more upscale, so dress to impress and come prepared to sample Seattle’s finest crab, salmon and oysters, complemented by all the champagne and sparkling wines your heart desires. To get in the right mood, start with the bubbles and oyster bar co-hosted by Ruffino sparkling wines and Taylor Shellfish Farms. If Guiness is more your style, be sure to check out their beer and oyster pairing bar. Chef Adam Stevenson at Copperleaf will have smoked sturgeon and caviar to share. PAIR WITH: Cocktails from The Halo Bar, hosted by Diageo, the parent company for Ketel One, Don Julio and other liquors. Ready for dessert? Acme Ice Cream is bringing flavors like espresso, fudge brownie and mint chocolate chip. Seattle magazine’s 100 Best Things to Eat: The Olympic Room will be dedicated to our February feature, with unmissable bites like Beecher’s World’s Best Mac and Cheese, No Anchor’s smoked mussels, ube cheesecake from Hood Famous Bakeshop and more. PAIR WITH: Beer, coffee and food presented by Visit Central Oregon—for the full Northwestern experience. Chef Derek Simcik of the Thompson Hotel is hosting the Charles Smith Food and Wine Pairing Lounge, where guests can enhance their eating experience with the perfect glass of wine, and vice versa. There will be exciting finds all over the place—be sure to save room for a cup of Loulay’s famous hot chocolate, and try a hand pie from The Wandering Goose on your way over to get some Dungeness crab salad from Copine. 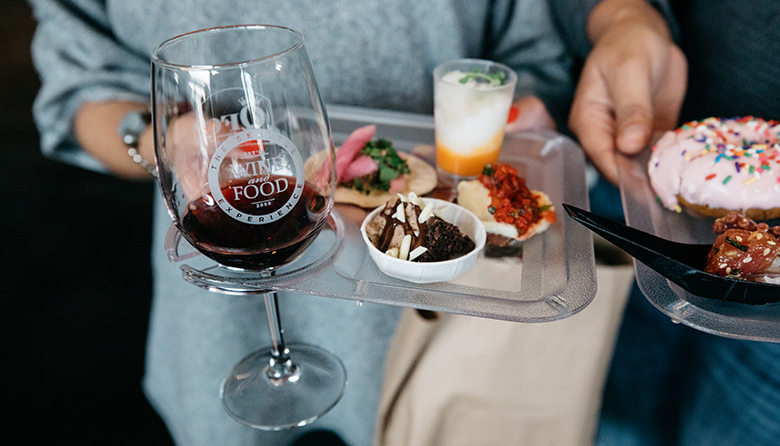 After the meal, there will be a chef’s after party to celebrate the end of a fantastic night like the pros do, with late-night snacks, entertainment and desserts from Salt & Straw and Tulalip Resort Casino—a celebration worthy of SWFE! To purchase tickets to the SWFE events, visit seattlewineandfoodexperience.com.